In an average day out and about, how often do you make ethical decisions? You care for the homeless, so shouldn’t you buy that Big Issue? And why not stop for that chugger (street fundraiser), who only wants to persuade you to make a direct debit to some extremely good cause? It’s time for a coffee, but how can you be sure your cup is Fair Trade? And still thinking about buying that iPad, or perhaps that worrying stuff about suicides in the Chinese factory where they make them holds you back? As for clothing and shoes, now where is child labour still going on? Can’t remember. A spot of fast-food lunch? Perhaps a hamburger. Who is to know where it comes from, even if they have stopped chopping down the rainforest to make pasture for grazing cows? So it isn’t easy to be a caring consumer. After all, many of us still drive petrol-fuelled cars, even though we know that contribute to global warming. We have to. There are some areas, however, where you can be sure that you are doing the right thing. Which is how I came to line up my misgivings with the right answers this week in Wright Brothers’ Soho Oyster House. For the past few years I’ve been trying, with limited success, to choose only fish which a restaurant can convince me comes from sustainable stock, caught in a small-scale enterprise that doesn’t have too much impact on a particular species. I did not have a chance to look up Wright Brothers beforehand, and when I saw pollock on the “specials” board I could not remember if this was the fish that is supposed to be the ethical alternative to cod. The wonderful thing about the oceans is they are giving us a sort of second chance, even though many familiar fish species are under serious threat. Suppose we suddenly found ourselves having to ease up on beef, lamb and pork, because the animals were at risk of population collapse, we would be hard pressed to find alternatives on land. Braised squirrel, anybody? Yet the oceans are still a phenomenally rich habitat, where fishermen can find us very tasty alternatives to hard-pressed staples such as cod and haddock. It is just that we have been very cautious about trying them in the past. The Marine Stewardship Council is in no doubt that we have to look beyond cod. It gives the North Atlantic population an orange 4 assessment (out of 5). “Should not be considered sustainable, and the fish is likely to have significant environmental issues associated with its production. With the exception of cod from the northeast Arctic, Iceland, Celtic Sea and Baltic, all other cod stocks in the northeast Atlantic are overfished, inefficiently managed or at an unknown level.” Pollock, on the other hand, and quite close to cod in texture, gets a level 2 (pale green) rating. Pollock, found throughout the northeast Atlantic, and belonging to the cod family, is still only a discard species for many fishermen, thrown back in, dead, as they go after the more lucrative cod. I’m sure consumers would relish the choice of this fish on the menu. My pollack, served under a spicy sauce over lentils, was impressively fresh. It has a moist, flaky white flesh, with an appealing, quite delicate flavour, and nothing to trouble even the fussiest fish eater. In 2009 Sainsbury’s decided to change pollock’s name on their shelves to colin, which confusingly is the French word for hake. However the supermarket does have a very high rating for its sustainable fish and to now have it, metaphorically, swimming off the shelves perhaps justifies a little bit of linguistic chicanery. Wrights says it takes only sustainable fish and shellfish, mainly from Cornish day boats fishing in the Helford River, Falmouth Bay and the Lizard. 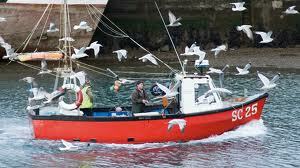 All its fish are line-caught and include mackerel, ling, sole, pollack, hake, haddock, whiting and sea bass. The MSC considers hand line fishing to be one of the most sustainable and species selective fishing methods available.